So Niko's got a ticket to San Andreas, does he? No wonder, at these crazy prices. 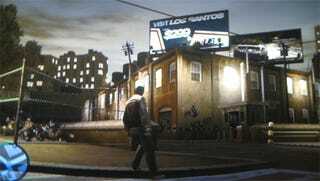 Reader Timmy spotted this billboard while cruising around Bohan, advertising cheap flights to Los Santos for only $299. Now, this is most likely just some cute inter-series referencing, but hey, if any of you want to keep on speculating that San An will be the setting for the next instalment in this generation's series (I seem to remember Vice City travel ads in GTA III, for example), go right ahead.